Shopping for Mortal Kombat Action Figures? The time is right for a little Mortal Kombat! 6-inch tall Reptile and Jax Action Figures. Featuring over 15 points of articulation and detailed costumes from the game! Internal Devastation! The time is right for a little Mortal Kombat. 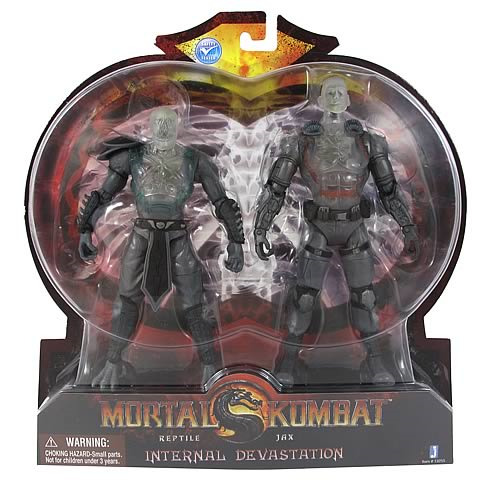 This awesome 2-pack is a must-have for any fan of Mortal Kombat. It contains terrific 6-inch tall Reptile and Jax Action Figures featuring over 15 points of articulation and detailed costumes from the game. Ages 17 and up.